The Fitbit stock price shot up today (Tuesday) after Morgan Stanley (NYSE: MS) upgraded Fitbit stock. As of 1:55 p.m., shares of Fitbit Inc. (NYSE: FIT) were up 8.1% and trading near $34.47. 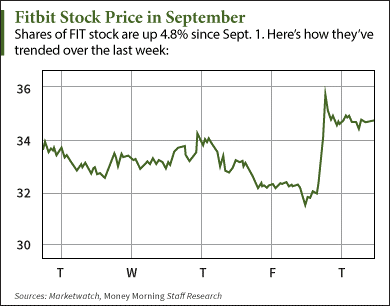 FIT stock surged 13% to $35.75 a share earlier in the day. That marks the highest intraday level since June 30, less than two weeks after the Fitbit IPO on June 17. The boost in the Fitbit stock price came after Morgan Stanley upgraded Fitbit stock to "overweight" – the equivalent of a "Buy" rating. The investment bank recently found that the company controls 21% of the wearable tech market. It set a price target of $58 and cited Fitbit's dominant market share over Apple Inc. (Nasdaq: AAPL) as the main factor behind the stock's growth. That represents a gain of more than 62% from today's high price. "We see less Apple Watch cannibalization risk," wrote Katy Huberty, a tech analyst for Morgan Stanley, in a note to investors today. "Fitbit's leadership in a large ($10B) and fast growth market merits a high valuation." 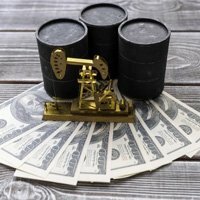 The stock still has momentum from its last stellar earnings report. Fitbit posted earnings of $0.21 per share in the second quarter, smashing Thomson Reuters estimates of $0.08. It generated revenue of $400 million and sold 4.5 million devices. Despite the company's strong market share and financials, we recommend holding off on buying Fitbit stock for a few more quarters. Fitbit's top- and bottom-line numbers need to keep showing the company has a firm grip on the market it supposedly dominates. That means consistently outselling competitors like the Apple Watch and Jawbone. "For them to succeed, they'll have to be agile and execute a plan to attack their niche market," Money Morning Defense & Tech Specialist Michael A. Robinson said when the Fitbit stock price soared after its IPO. "They need to figure out how long they can sustain a competitive advantage." Alex McGuire is an associate editor for Money Morning who writes about upcoming IPOs. Follow him on Twitter at @AlexMcGuire92 for all of the biggest IPO news.